How to create an animated DVD menu? How to add music to my DVD menu? 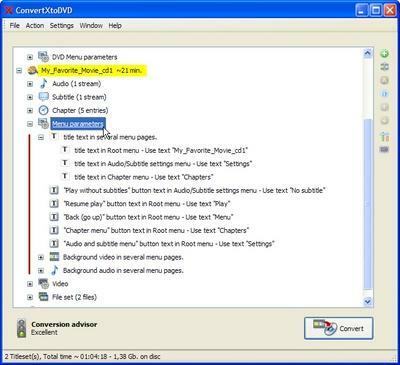 1)	Download and install the latest version of ConvertXtoDVD. 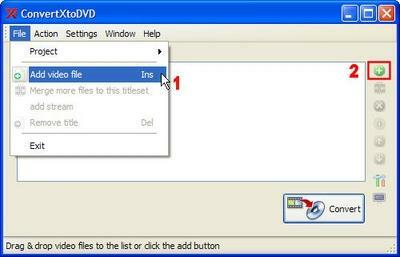 2)	Add a video file or multiple video files. 3)	Select a menu template by clicking on Template and using the drop down box. Highlight the template you want and then click on the green check mark. 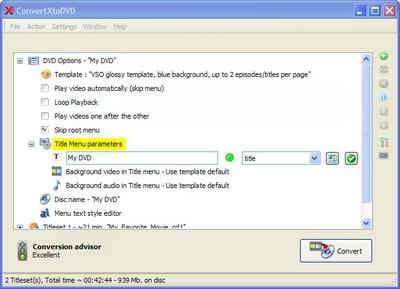 If you want to read about the characteristics of the template after you have selected it, move you mouse over DVD Options – “My DVD” (highlighted in Figure B). 4)	For this example I have chosen a VSO glossy template - providing the most customizable features. Click on the + next to Title Menu parameters to see what items you can customize for the Title Menu. Some templates, by design, have more or less customizable items. In this example I can edit the text of the Title Menu, choose a background video and audio file to place in the background. When editing text items, the colored circles (red or green) indicate whether you text needs attention or not. Red means that the text is too long and will either be cropped or reduced in menu unless you change the text to make it short enough so that the circle changes to the color green. Green means the text fits into the space provided. In the Title Menu, by default of the VSO Glossy templates, menus do not play an audio or video file, but you can force it to do so by selecting file. In the root menu, by default, you will have audio and video playing in the background. 5)	Under each file you added to your project you will have a section Menu Parameters where you can define the settings related to the menu for each video file added. The first 3 items, as displayed in figure D, are the text for the titles of the 3 menus that could exist for this video file. The next 5 text items are related to the action buttons that are displayed in the Menus. 6)	For the Root Menu of this video file you can have a video and/or audio sequence play in the background. By default in the VSO Glossy templates play a small portion of the video and audio file in loop in the Root Menu. Click on the + next to Background to see all the places where a video file will play (chapter menu, audio/subtitle menu, etc.). To change this to another file double click on the word Background and select “Use a custom file”. On the top line you can specify at what time in the video file you want the sequence to start from. Beneath that you can apply a transparency for your video Sequence. As there is a blue layer that overlays the whole menu you can make the video file less or more transparent over this blue layover (where 0 = transparent and 255 =opaque). You can select “Remove (will not appear) for this item if you do not want a background audio or video file playing.. To select a custom audio file follow the same procedure. Now convert and burn your files. You can watch you’re result with a video player such as VLC to verify that your result is satisfactory before burning it to DVD. (Action / Burn a project already converted).